One of the best parts of celebrating Halloween is watching a good scary movie. Whether you are spending time with a date and want the extra cuddle time or you just enjoy scary movies, you need to take time to watch some of these classics this year. These are the top ten movies for Halloween. Poltergeist is one of the classic scary movies. 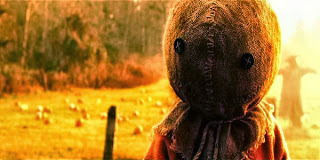 It is creepy enough to scare some adults, but at the same time safe for kids who love to be scared, as well. This was written by Steven Spielberg and MichealGrais and instantly became a classic. If you are looking for good scary movies, you have to include The Exorcist on your list. This is the movie that will keep you up at night, wishing you had never watched it. It is a classic story of demonic possession and the attempts to save the girl. We have another Kind of Epic author on our show this week! Teaming up with Racebending.com Gabe talks to Mitali Perkins a young adult and childrens fiction author who opened up very personally on the subject of race and humor for her book Open Mic and for us. Remember to follow us on twitter @kindofepicshow and our two epic hosts this week @Davidwestkoes and @gabrialcanada as well as our guest Mihtali @MitaliPerkins who was kind enough to give us her time. Not all holiday-themed movies can hold up and stand the test of time. Now there's a decent sized list of movies that do, whether it be a Thanksgiving film like "Planes, Trains & Automobiles", a Christmas movie like "Christmas Vacation"; or, in this case, a lovable Halloween movie like "Ernest Scared Stupid". 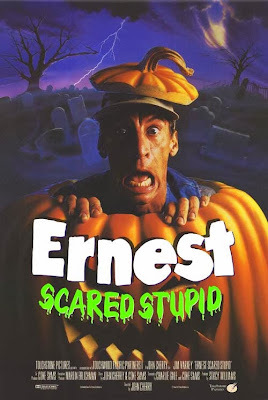 I’m sure "Ernest Scared Stupid" is not the first film that pops into your head when you think about Halloween movies, and, in fact, it's often forgotten. But make no mistake; it's a film that truly holds up due mostly to Jim Varney’s wacky alter-ego as Ernest P. Worrell. Some might argue that "Ernest Goes to Camp" is the alpha-omega Ernest movie and I can’t disagree, but there’s just something special about 1991's "Ernest Scared Stupid", one of the later films in the franchise. The plot is simple: after a misunderstanding, Ernest P. Worrell unleashes an evil troll on Halloween. 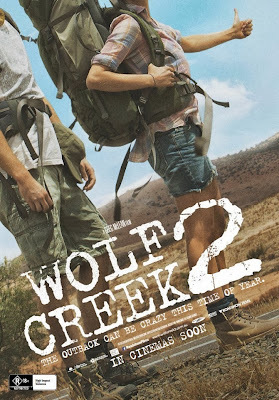 Finally, the official one sheet poster for Greg McLean's Wolf Creek 2 has been released. “Lured by the promise of an Australian holiday, backpackers Rutger, Katarina, and Paul visit the notorious Wolf Creek Crater. Their dream Outback adventure soon becomes a horrific reality when they encounter the site’s most infamous local, the last man any traveler to the region ever wants to meet; Mick Taylor (John Jarratt). As the backpackers flee, Mick pursues them on an epic white knuckled rampage across hostile wasteland. Only one will remain to be dragged back to his lair to witness the true magnitude of his monstrosity. And if the last man standing is to have any hope of surviving where no one else has survived before, he’ll have to use every ounce of cunning to outwit the man behind the monster and become every bit as ruthless as the monster inside the man.“ I rather enjoyed the first Wolf Creek, so it's a given that I'll give the sequel a go. The 2014 reboot of the classic 1987 RoboCop ran into trouble with fans early on. Rumors that director Joel Kinnaman would shoot for a PG-13 rating and the early shots of a high-tech black suit had purists taking to Twitter to malign the film in 2012. A year—and several trailers later—some reviewers are willing to hold their words to see exactly what this new RoboCop has to offer, and many are interested in the modern tech that will make the film more believable for today's audiences. As with Iron Man, the most important piece of tech in RoboCop is the suit. Unlike the Stark suit, which Tony can jump in and out of at will, the RoboCop gear is less suit and more exoskeleton. The badly injured Alex Murphy is put into the suit as a way to save his life. Although he can remove certain elements, like the faceplate, he essentially becomes one with the suit. Kind Of Epic Show: KOES: Sunday Morning Cartoon Special! We also examine the roots of our anime/animation obsessions. Officially Knight Sir Levar Burton a Knight of Epic Show, talk about Captain Planet and its upcoming live action adaptation, and dish on TMNT and Legend of Korra on Nickelodeon. our epic hosts @gabrialcanada and @DavidWest_KOES as always we read your tweets on the air and may send you Kind of Epic Schwag for your troubles. Note: this episode was record at the same time as last weeks Don Jon review. In Which Our Heroes Talk Don Jon, Plus David Gilman and Matt are welcomed back. Kind Of Epic Show: Batfleck Was The Bomb In Phantoms Yo! As the title suggests the Kind of Epic crew provide their thoughts on the Batman casting as well as adding their own casting dreams for the Justice League. General discussion is had in which we confirm Aquaman is indeed a badass and we talk heavily about Afleck's past work. We also tackle the question that was on the cover of USA today, Where are the Female Super Hero films? We try and discuss heroines who aren't just derivative or condescendingly weaker iterations of their male equivalents. No girl, she, or Ms. added to their titles. The possibility of a Guilermo Del Toro Zatanna film, Katee Sackhoff as Captain Marvel, and perhaps Silver Sable getting some more love in comics, film or tv. As always keep it epic! 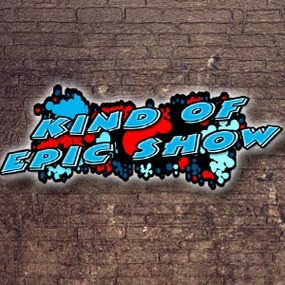 And remember to follow us @kindofepicshow and subscribe to us on itunes and the windows phone store. Two working titles for Star Wars Episode VII have been revealed. But since Disney now owns them, there's no guarantee they will use any of these two -- but these are titles that George Lucas picked. Thoughts? Personally, I like Rise of the Jedi. Continuing our top five lists which began back in July with the The 5 Scariest Fourth of July-Themed Movies, I give you my list for the top five Halloween-themed horror movies. 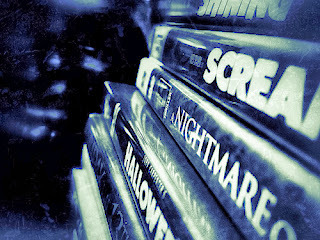 Now there are a lot of movies centered around Halloween, so I thought it'd only be fitting to focus on the scary ones. After all, Halloween is supposed to be spooky, right? At the five-spot is a fun little horror outing directed by Jeff Lieberman, which tells the story of a young boy who, on Halloween night, is unknowingly assisting a serial killer commit a string of murders. You'll laugh, you'll cringe...you'll have a good time.